Setting boundaries has been hard for me. We women are conditioned to put others’ needs before our own. When I tried to set boundaries in the past I’d be called names, told I was ‘selfish,’ and was guilt-tripped until I caved. Caving worked in the short term, but it doesn’t work in the long run. Resentment gets built up, which is not healthy. I didn’t like being a pushover. 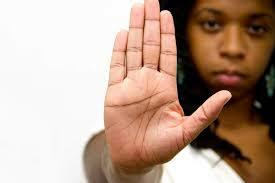 Through Defend Yourself, I learned the tools to set and maintain boundaries. At a recent job, one woman who I worked under grabbed my wrist when I was about to stamp a document in the wrong place. I would be afraid to speak up in instances like that at jobs in the past because being in a shaky financial situation I could not afford to lose those jobs. However, something in me sparked though I may be on the bottom rung at many of these jobs, I still felt I deserved respect. I used a firm voice and told her, ‘You do not have to touch me like that.’ I set another boundary when she touched me again in another instance and reiterated that she did not need to touch me. She has not touched me inappropriately since. I have continued to set boundaries in other ways at this job and am proud of myself for doing such. Setting boundaries is a two steps forward/two steps back thing. It’ll take time and repetition until it becomes easier for me to do. I realize that people will continue to call me names, lay guilt trips, and throw tantrums when they don’t get their way and it hurts, but thats on them, not me. Setting boundaries is about putting oneself first, and Im glad that I learned to put myself first. Check out #9 in our series of videos showing self-defense strategies to use against harassers and bullies! Lauren shares some great ways to keep your skills fresh and reminds us that we’re all worth defending. Check out #8 in our series of videos showing self-defense strategies to use against harassers and bullies! Lauren and Sarah show you how to apply all the self-defense principles at once, whether it’s with a stranger, a neighbor, or a dangerous ex. Check out #7 in our series of videos showing self-defense strategies to use against harassers and bullies! Sarah and Lauren demonstrate different combinations of strikes you can use to defend yourself from an attack, even if the attacker is behind you. Check out #6 in our series of videos showing self-defense strategies to use against harassers and bullies! Sarah and Laura show hits and strikes that work for people at many levels of strength and athletic ability. Thank you for a wonderful class. I will spread the word around my high school and to every interested girl/woman I know! This class not only showed me how to defend my body, but it taught me how to express myself as well. It nurtured my soul and showed me that to be a woman does not mean that I am physically helpless. To my surprise, I found the verbal parts of the class the most beneficial. Instead of just preparing us for the chance of an all-out attack, we learned skills that have been helping me to navigate more assertively through everyday situations. You helped all of us to view self-defense holistically, and asked us to question our role in making this world less violent. The teachers role-modeled being strong women. This class opened a door for me that I didn’t know existed. I know exactly what I would do if I needed to. It was the first time in my life that I felt that. Even if something happened, I would still feel safe in myself.